Typical kits of modular breweries MODULO with the brewhouse Breworx Classic 1000 and CCT fermenters with volume 1000 liters. Micro Breweries MODULO CLASSIC 1000 are simple brewery sets what customers assembly themself without our technician specialists. The modular microbrewery kit MODULO CLASSIC 1001SSM-CF750G with the brewhouse unit MODULO CLASSIC 1000 allows you the production from 1000 to 4000 liters beer per day. This configuration of the brewery includes set of tanks with production capacity up to 75.000 liters beer produced by on surface fermentation method or 45.000 liters beer produced by under bottom fermentation method. Simple design with independent modular devices allows easy assembling of the full brewery from several compact modules only by customer without our specialists. Price of this configuration doesn´t include assembly work – we suppose the assembling is ensured customer himself according the assembly manual. The modular microbrewery kit MODULO CLASSIC 1001SSM-CF1500G with the brewhouse unit MODULO CLASSIC 1000 allows you the production from 1000 to 4000 liters beer per day. This configuration of the brewery includes set of tanks with production capacity up to 150.000 liters beer produced by on surface fermentation method or 90.000 liters beer produced by under bottom fermentation method. Simple design with independent modular devices allows easy assembling of the full brewery from several compact modules only by customer without our specialists. Price of this configuration doesn´t include assembly work – we suppose the assembling is ensured customer himself according the assembly manual. 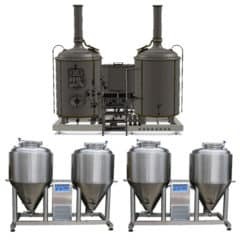 The modular microbrewery kit MODULO CLASSIC 1001SSM-CF3000G with the brewhouse unit MODULO CLASSIC 1000 allows you the production from 1000 to 4000 liters beer per day. This configuration of the brewery includes set of tanks with production capacity up to 300.000 liters beer produced by on surface fermentation method or 180.000 liters beer produced by under bottom fermentation method. Simple design with independent modular devices allows easy assembling of the full brewery from several compact modules only by customer without our specialists. Price of this configuration doesn´t include assembly work – we suppose the assembling is ensured customer himself according the assembly manual. The modular microbrewery kit MODULO CLASSIC 1001SSM-CF3750G with the brewhouse unit MODULO CLASSIC 1000 allows you the production from 1000 to 4000 liters beer per day. This configuration of the brewery includes set of tanks with production capacity up to 375.000 liters beer produced by on surface fermentation method or 225.000 liters beer produced by under bottom fermentation method. Simple design with independent modular devices allows easy assembling of the full brewery from several compact modules only by customer without our specialists. Price of this configuration doesn´t include assembly work – we suppose the assembling is ensured customer himself according the assembly manual.